Surprise your special princess with a party she will always remember! If she is a fan of Beauty and the Beast, then she will love our tableware collection featuring these Beauty and the Beast Square Plates. Whether it's a birthday or other special occasion, any princess would be delighted to receive their cake or ice cream on one of these dessert sized plates. Each plate measures 7 inches square, and each package contains eight plates. Check out our full line of coordinating Beauty and the Beast accessories. 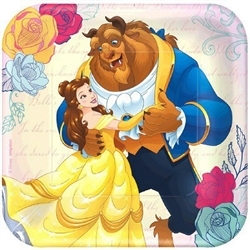 Beauty and the Beast Beverage Napkins Beauty and the Beast Favor Cup Beauty and the Beast Luncheon Napkins Beauty and the Beast Square Plates 9"